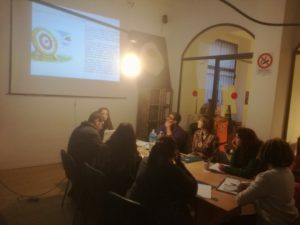 E’ ufficialmente iniziato il progetto PANDORA – Discovering European Opportunities for Female Entrepreneurship con le prime due giornate di kick-off che hanno avuto luogo a Palermo nei giorni del 13 e 14 gennaio 2017. Ci siamo incontrati con i rappresentanti delle associazioni partner del progetto, provenienti da Turchia (Yenimahalle Municipality), Inghilterra (The Ubele Initiative) e Polonia (Autokreacja Foundation). 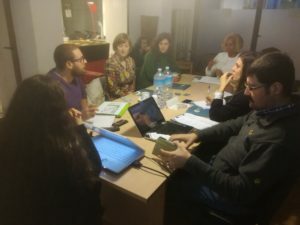 La realizzazione di questo progetto è stata possibile grazie al co-finanziamento da parte dell’Agenzia Nazionale Indire, tramite il programma Erasmus plus della Commissione Europea. Sono stati due giorni intensi, nei quali abbiamo iniziato a conoscerci, a condividere le esperienze delle nostre realtà locali e a costruire insieme le fondamenta di un percorso di scambio internazionale che andrà avanti per i prossimi due anni e che speriamo/prevediamo continui anche dopo la fine del progetto. L’idea di Pandora da parte di H.R.Y.O. è nata e si è sviluppata grazie alla condivisione di alcune donne migranti e di quartieri svantaggiati delle loro esigenze e delle loro aspettative. Durante chiacchierate informali sono emerse la speranza e il desiderio e la sfida di riuscire a valicare le loro barriere contestuali come la mancanza di una formazione informatica e/o linguistica, ma anche di un’assenza di risorse economiche. Per rispondere all’esigenza di fornire una formazione capace di dare input costruttivi e reali, abbiamo deciso di creare uno spazio per queste donne. Questo spazio si concretizzerà in momenti di formazione e confronto e servirà ad aumentare le loro competenze a livello informatico, linguistico e tecnico/commerciale e contemporaneamente a formare operatori nell’ambito dell’educazione agli adulti. Il progetto permetterà ai partecipanti di entrare in contatto con una realtà multiculturale e diversificata dove idee, passioni e sogni potranno entrare in contatto ed essere confrontate. Hello there, simply was alert to your weblog through Google, and located that it’s really informative. I am gonna be careful for brussels. I will be grateful for those who continue this in future. Heya are usin WordPress for your site platform? Thanks for expressing your ideas listed here. The other matter is that every time a problem develops with a computer motherboard, people today should not take the risk of repairing the item themselves for if it is not done correctly it can lead to irreparable damage to the complete laptop. It will always be safe to approach any dealer of your laptop for that repair of its motherboard. They’ve got technicians who’ve an expertise in dealing with laptop motherboard complications and can have the right analysis and undertake repairs. One thing is that one of the most common incentives for applying your credit card is a cash-back or perhaps rebate supply. Generally, you’ll get 1-5% back upon various buying. Depending on the credit cards, you may get 1% back on most acquisitions, and 5% back again on expenditures made in convenience stores, gas stations, grocery stores and also ‘member merchants’. Quand le loup la poursuit. My family all the time ssay that I am killping my time here at net, but I know I aam getting familiarity every day by reading thes pleasant posts. I just want to mention I am just newbie to blogs and definitely loved your website. Most likely I’m planning to bookmark your blog . You certainly come with wonderful writings. Cheers for revealing your web-site. Thanks for finally writing about >PANDORA Kick-off – HRYO – Human Rights Youth Organization <Liked it! Spot on with this write-up, I truly assume this website needs much more consideration. I抣l most likely be again to read rather more, thanks for that info. Now i’m genuinely inspired with your way with words-at all along with while using the format for your blog site. Is it any paid concept or have you customize the item yourself? In any case remain the wonderful premium quality creating, it is actually uncommon to peer a great website like this one right now. I just want to say I’m very new to blogging and site-building and honestly liked your web-site. Probably I’m likely to bookmark your website . You certainly have perfect stories. Appreciate it for sharing your website. I simply want to mention I’m all new to blogs and seriously liked your web page. Likely I’m likely to bookmark your blog post . You actually have superb articles. Thank you for revealing your website page. I just want to mention I am beginner to blogs and honestly liked you’re web-site. Probably I’m going to bookmark your website . You certainly come with exceptional well written articles. With thanks for revealing your web-site. Excellent site. Lots of helpful info here. I’m sending it to several friends ans also sharing in delicious. Just wanna remark that you have a very nice web site , I like the layout it actually stands out. I do not even understand how I stopped up right here, but I thought this post was once good. I do not realize who you might be however certainly you are going to a well-known blogger when you aren’t already. Cheers! We once saw this same situation when I heard these songs on spotify. Greetings, Could I grab your own photograph and make use of it on my own blog page? obviously like your web site however you need to take a look at the spelling on quite a few of your posts. Many of them are rife with spelling problems and I to find it very bothersome to inform the reality nevertheless I’ll definitely come again again. Thank you for some other magnificent article. Where else may just anybody get that type of information in such an ideal way of writing? I have a presentation next week, and I’m on the search for such info. My husband and i ended up being very cheerful when Ervin could finish off his investigation through the ideas he came across from your weblog. It is now and again perplexing to simply happen to be giving out key points which others could have been trying to sell. So we know we have you to be grateful to because of that. The explanations you made, the straightforward web site navigation, the friendships you help foster – it is many fabulous, and it’s helping our son and the family know that this idea is fun, and that’s incredibly vital. Thanks for all the pieces! I’ve been browsing on-line greater than three hours these days, yet I by no means found any fascinating article like yours. It is beautiful price sufficient for me. In my view, if all site owners and bloggers made just right content material as you did, the internet will be a lot more helpful than ever before. Generally I do not read article on blogs, but I would like to say that this write-up very pressured me to check out and do it! Your writing taste has been surprised me. Thanks, very great post. Its like you read my mind! You appear to know a lot about this, like you wrote the book in it or something. I think that you could do with a few pics to drive the message home a little bit, but other than that, this is fantastic blog. A fantastic read. I’ll definitely be back. Hi, i think that i saw you visited my website so i came to “return the favor”.I am attempting to find things to improve my web site!I suppose its ok to use a few of your ideas!! fantastic post, very informative. I’m wondering why the opposite experts of this sector don’t understand this. You should continue your writing. I am confident, you’ve a huge readers’ base already! Heya! I just wanted to ask if you ever have any problems with hackers? My last blog (wordpress) was hacked and I ended up losing many months of hard work due to no back up. Do you have any solutions to stop hackers? Woah! I’m really digging the template/theme of this website. It’s simple, yet effective. A lot of times it’s very difficult to get that “perfect balance” between superb usability and appearance. I must say you’ve done a awesome job with this. Additionally, the blog loads extremely fast for me on Internet explorer. Outstanding Blog! Hi there. I discovered your blog by way of Google even as looking for a related topic, your site came up. It seems to be good. I’ve bookmarked it in my google bookmarks to visit then. Hey there. I discovered your site by the use of Google whilst looking for a comparable topic, your web site got here up. It seems good. I’ve bookmarked it in my google bookmarks to come back then. Hey there. I found your blog by means of Google at the same time as searching for a comparable topic, your website got here up. It appears good. I have bookmarked it in my google bookmarks to visit then. Hiya, I’m really glad I’ve found this info. Nowadays bloggers publish just about gossip and net stuff and this is really frustrating. A good blog with interesting content, that is what I need. Thank you for making this website, and I will be visiting again. Do you do newsletters by email? Hiya, I’m really glad I have found this information. Today bloggers publish only about gossip and net stuff and this is actually irritating. A good site with exciting content, that’s what I need. Thank you for making this website, and I will be visiting again. Do you do newsletters by email? Hey there. I found your blog by means of Google even as searching for a comparable subject, your website came up. It appears to be good. I’ve bookmarked it in my google bookmarks to come back then. Hiya, I am really glad I’ve found this info. Today bloggers publish just about gossip and net stuff and this is really annoying. A good web site with exciting content, this is what I need. Thank you for making this website, and I will be visiting again. Do you do newsletters by email? Hi there. I found your site by way of Google even as looking for a related subject, your web site got here up. It appears to be good. I have bookmarked it in my google bookmarks to come back then. Hello there. I found your blog by way of Google even as searching for a similar topic, your website got here up. It appears to be great. I have bookmarked it in my google bookmarks to visit then. Hiya, I am really glad I’ve found this info. Nowadays bloggers publish just about gossip and internet stuff and this is actually frustrating. A good site with exciting content, that’s what I need. Thanks for making this site, and I’ll be visiting again. Do you do newsletters by email? Hello there. I found your web site via Google whilst searching for a similar subject, your website got here up. It looks good. I’ve bookmarked it in my google bookmarks to visit then. Hey there. I discovered your site via Google even as searching for a related topic, your site got here up. It seems great. I’ve bookmarked it in my google bookmarks to come back then. It’s really a cool and helpful piece of information. I am satisfied that you shared this helpful information with us. Please stay us up to date like this. Thanks for sharing. There is definately a great deal to learn about this topic. I really like all the points you have made. Hey there. I discovered your site via Google while searching for a comparable topic, your web site got here up. It seems to be great. I’ve bookmarked it in my google bookmarks to come back then. Hiya, I’m really glad I’ve found this information. Today bloggers publish only about gossip and internet stuff and this is actually frustrating. A good website with interesting content, this is what I need. Thanks for making this website, and I’ll be visiting again. Do you do newsletters by email? Hello there. I found your web site by means of Google at the same time as looking for a similar matter, your web site came up. It appears good. I’ve bookmarked it in my google bookmarks to visit then. Hey there. I found your web site via Google whilst looking for a similar subject, your website got here up. It appears to be good. I have bookmarked it in my google bookmarks to visit then. Hiya, I’m really glad I’ve found this information. Today bloggers publish just about gossip and web stuff and this is actually irritating. A good site with interesting content, that’s what I need. Thank you for making this website, and I will be visiting again. Do you do newsletters by email? Hello there. I discovered your website by means of Google while looking for a comparable subject, your site came up. It seems great. I’ve bookmarked it in my google bookmarks to come back then. Hiya, I am really glad I’ve found this info. Nowadays bloggers publish only about gossip and internet stuff and this is really frustrating. A good blog with exciting content, that is what I need. Thanks for making this web site, and I’ll be visiting again. Do you do newsletters by email? Hi there. I found your site via Google while looking for a similar subject, your web site got here up. It looks great. I have bookmarked it in my google bookmarks to come back then. Hey there. I found your web site by means of Google at the same time as looking for a comparable subject, your website got here up. It looks great. I’ve bookmarked it in my google bookmarks to visit then. Hey there. I found your blog by means of Google at the same time as searching for a related subject, your web site came up. It looks great. I’ve bookmarked it in my google bookmarks to come back then. Thanks , I have recently been searching for information approximately this subject for a while and yours is the best I’ve found out till now. However, what about the conclusion? Are you certain about the supply? I do consider all the ideas you have presented on your post. They’re really convincing and can certainly work. Still, the posts are very short for beginners. May you please lengthen them a little from subsequent time? Thank you for the post. Hi my friend! I wish to say that this article is amazing, great written and include almost all vital infos. I would like to see extra posts like this . You completed several nice points there. I did a search on the matter and found nearly all persons will go along with with your blog. I have to show appreciation to this writer just for rescuing me from such a issue. Because of looking through the world wide web and obtaining solutions which are not pleasant, I believed my life was gone. Living devoid of the solutions to the issues you’ve fixed by means of your good site is a serious case, as well as the kind that could have badly damaged my entire career if I hadn’t noticed your blog. Your good skills and kindness in maneuvering all things was valuable. I am not sure what I would have done if I had not come upon such a stuff like this. It’s possible to now look ahead to my future. Thanks for your time so much for your skilled and amazing guide. I will not be reluctant to suggest your web site to anyone who needs to have assistance on this subject. Thanks a lot for providing individuals with remarkably terrific chance to discover important secrets from here. It is often so pleasurable plus jam-packed with a lot of fun for me and my office colleagues to search your blog more than 3 times a week to read the new issues you have. And of course, we are certainly satisfied with the perfect thoughts you give. Certain 4 ideas in this article are clearly the best we have ever had. Hiya, I’m really glad I’ve found this info. Today bloggers publish only about gossip and web stuff and this is really annoying. A good site with exciting content, this is what I need. Thanks for making this site, and I’ll be visiting again. Do you do newsletters by email? Hiya, I am really glad I’ve found this info. Today bloggers publish just about gossip and net stuff and this is really frustrating. A good web site with exciting content, this is what I need. Thanks for making this website, and I’ll be visiting again. Do you do newsletters by email? Hiya, I am really glad I have found this info. Today bloggers publish just about gossip and web stuff and this is really irritating. A good web site with interesting content, that’s what I need. Thanks for making this site, and I’ll be visiting again. Do you do newsletters by email? Hi there. I discovered your blog via Google at the same time as looking for a comparable subject, your website came up. It seems to be great. I’ve bookmarked it in my google bookmarks to visit then. Hello there. I found your blog via Google even as looking for a related matter, your web site came up. It appears to be great. I have bookmarked it in my google bookmarks to come back then. Hiya, I am really glad I have found this info. Nowadays bloggers publish only about gossip and net stuff and this is really frustrating. A good blog with exciting content, this is what I need. Thanks for making this web-site, and I’ll be visiting again. Do you do newsletters by email? Hello there. I discovered your blog by way of Google whilst searching for a comparable matter, your site came up. It seems to be good. I’ve bookmarked it in my google bookmarks to visit then. Hiya, I’m really glad I’ve found this info. Nowadays bloggers publish just about gossip and web stuff and this is really frustrating. A good website with exciting content, that is what I need. Thank you for making this web-site, and I will be visiting again. Do you do newsletters by email? Hey there. I discovered your site by the use of Google even as searching for a related subject, your website got here up. It seems great. I have bookmarked it in my google bookmarks to visit then. Hiya, I am really glad I’ve found this information. Nowadays bloggers publish only about gossip and web stuff and this is really frustrating. A good website with exciting content, this is what I need. Thanks for making this web-site, and I will be visiting again. Do you do newsletters by email? Hiya, I’m really glad I have found this info. Nowadays bloggers publish only about gossip and net stuff and this is actually frustrating. A good website with exciting content, that’s what I need. Thanks for making this website, and I will be visiting again. Do you do newsletters by email? Hi there. I discovered your website by the use of Google while searching for a similar subject, your site got here up. It seems good. I’ve bookmarked it in my google bookmarks to come back then. Hey there. I found your web site by means of Google whilst searching for a related topic, your website got here up. It looks good. I’ve bookmarked it in my google bookmarks to visit then. Hiya, I’m really glad I’ve found this information. Today bloggers publish only about gossip and net stuff and this is actually frustrating. A good site with interesting content, this is what I need. Thanks for making this site, and I will be visiting again. Do you do newsletters by email? Hi there. I discovered your site via Google whilst searching for a related matter, your site came up. It appears good. I have bookmarked it in my google bookmarks to come back then. Hi there. I found your website by means of Google even as looking for a related topic, your web site came up. It seems good. I have bookmarked it in my google bookmarks to visit then. Hello there. I discovered your blog by way of Google even as searching for a comparable subject, your website came up. It appears great. I have bookmarked it in my google bookmarks to come back then. Hiya, I’m really glad I’ve found this information. Nowadays bloggers publish only about gossip and net stuff and this is really annoying. A good web site with exciting content, that is what I need. Thank you for making this site, and I will be visiting again. Do you do newsletters by email? Hiya, I’m really glad I have found this information. Today bloggers publish only about gossip and internet stuff and this is actually frustrating. A good website with interesting content, this is what I need. Thanks for making this web-site, and I’ll be visiting again. Do you do newsletters by email? Hiya, I am really glad I’ve found this information. Today bloggers publish only about gossip and internet stuff and this is actually frustrating. A good blog with exciting content, this is what I need. Thank you for making this web site, and I will be visiting again. Do you do newsletters by email? Hi there. I discovered your web site by means of Google while looking for a related subject, your web site got here up. It looks good. I have bookmarked it in my google bookmarks to come back then. Hello there. I discovered your website by way of Google even as searching for a related matter, your web site got here up. It seems good. I have bookmarked it in my google bookmarks to come back then. Hey there. I discovered your site via Google whilst looking for a related matter, your site got here up. It looks great. I’ve bookmarked it in my google bookmarks to come back then. Hiya, I’m really glad I have found this info. Today bloggers publish just about gossip and net stuff and this is really frustrating. A good blog with interesting content, this is what I need. Thanks for making this web site, and I will be visiting again. Do you do newsletters by email? What’s up everyone, it’s my first pay a visit at this website, and post is truly fruitful in support of me, keep up posting these articles. I have read so many articles concerning the blogger lovers but this article is in fact a fastidious piece of writing, keep it up. Valuable information. Fortunate me I found your web site by accident, and I’m surprised why this coincidence didn’t came about earlier! I bookmarked it. Hiya, I’m really glad I have found this information. Nowadays bloggers publish only about gossips and internet and this is really annoying. A good site with interesting content, this is what I need. Thanks for keeping this web-site, I will be visiting it. Do you do newsletters? Can’t find it. Very good written article. It will be helpful to anyone who utilizes it, as well as yours truly :). Keep doing what you are doing – i will definitely read more posts. Thank you for any other informative website. Where else could I get that kind of info written in such an ideal method? I have a project that I am just now operating on, and I have been on the look out for such info. Needed to draft you a little word just to give thanks once again relating to the striking tactics you have discussed in this article. It is certainly incredibly generous with you giving easily all that most of us might have made available for an ebook to end up making some cash for their own end, and in particular considering that you could possibly have done it in the event you desired. The tricks additionally worked to become a great way to understand that someone else have the identical passion just like my very own to see whole lot more with respect to this issue. I am certain there are thousands of more pleasant situations ahead for people who examine your site. Excellent goods from you, man. I’ve understand your stuff previous to and you’re just too excellent. I actually like what you have acquired here, certainly like what you’re stating and the way in which you say it. You make it entertaining and you still take care of to keep it wise. I can not wait to read far more from you. This is really a tremendous web site. Hey there. I found your web site via Google whilst searching for a similar matter, your website came up. It seems good. I’ve bookmarked it in my google bookmarks to come back then. Hi there. I found your website by the use of Google at the same time as searching for a comparable topic, your site came up. It looks great. I’ve bookmarked it in my google bookmarks to visit then. Hello there. I discovered your blog by way of Google whilst searching for a similar topic, your website got here up. It appears to be great. I have bookmarked it in my google bookmarks to visit then. Hiya, I’m really glad I’ve found this information. Nowadays bloggers publish only about gossip and internet stuff and this is really frustrating. A good web site with interesting content, that’s what I need. Thanks for making this site, and I will be visiting again. Do you do newsletters by email? wonderful post, very informative. I’m wondering why the opposite specialists of this sector don’t understand this. You must proceed your writing. I’m sure, you have a great readers’ base already! You made certain fine points there. I did a search on the theme and found nearly all persons will go along with with your blog. Hiya, I’m really glad I have found this info. Today bloggers publish just about gossip and net stuff and this is actually irritating. A good blog with exciting content, this is what I need. Thanks for making this web site, and I’ll be visiting again. Do you do newsletters by email? Hello there, You’ve done a great job. I’ll definitely digg it and personally suggest to my friends. I am confident they’ll be benefited from this website. Hi there. I discovered your web site via Google whilst searching for a similar topic, your site came up. It seems to be good. I’ve bookmarked it in my google bookmarks to come back then. Hiya, I am really glad I have found this info. Today bloggers publish only about gossip and net stuff and this is actually irritating. A good website with exciting content, that’s what I need. Thank you for making this web-site, and I will be visiting again. Do you do newsletters by email? Hey there. I found your site by way of Google at the same time as looking for a comparable topic, your website got here up. It looks great. I’ve bookmarked it in my google bookmarks to come back then. Hey there. I found your website by way of Google while searching for a similar subject, your site got here up. It looks great. I have bookmarked it in my google bookmarks to come back then. I’ve been surfing online more than three hours today, yet I never found any interesting article like yours. It’s pretty worth enough for me. In my view, if all website owners and bloggers made good content as you did, the web will be much more useful than ever before. Hey there. I discovered your blog by way of Google even as looking for a related subject, your site got here up. It seems great. I have bookmarked it in my google bookmarks to visit then. Hiya, I am really glad I have found this information. Nowadays bloggers publish only about gossip and net stuff and this is really frustrating. A good web site with interesting content, this is what I need. Thank you for making this website, and I will be visiting again. Do you do newsletters by email? Hiya, I’m really glad I have found this info. Today bloggers publish just about gossip and web stuff and this is actually annoying. A good blog with exciting content, this is what I need. Thank you for making this web site, and I’ll be visiting again. Do you do newsletters by email? Hi there. I discovered your blog via Google at the same time as searching for a comparable matter, your website came up. It seems to be great. I’ve bookmarked it in my google bookmarks to visit then. Hiya, I am really glad I have found this info. Nowadays bloggers publish just about gossip and net stuff and this is actually irritating. A good website with exciting content, that’s what I need. Thank you for making this web-site, and I will be visiting again. Do you do newsletters by email? Hi there. I discovered your website by means of Google at the same time as looking for a comparable matter, your web site came up. It seems to be good. I’ve bookmarked it in my google bookmarks to visit then. Hello there. I found your web site via Google at the same time as looking for a related matter, your site got here up. It looks good. I have bookmarked it in my google bookmarks to come back then. Hey there. I found your site by way of Google at the same time as searching for a similar matter, your website came up. It appears to be great. I’ve bookmarked it in my google bookmarks to come back then. Hello there. I discovered your site by the use of Google whilst searching for a related matter, your web site got here up. It seems to be good. I have bookmarked it in my google bookmarks to come back then. Hey there. I discovered your web site by means of Google whilst looking for a similar topic, your website got here up. It seems to be great. I’ve bookmarked it in my google bookmarks to visit then. Hiya, I am really glad I’ve found this information. Nowadays bloggers publish only about gossip and web stuff and this is really annoying. A good site with exciting content, that’s what I need. Thanks for making this web site, and I’ll be visiting again. Do you do newsletters by email? Hiya, I’m really glad I’ve found this info. Today bloggers publish only about gossip and web stuff and this is actually annoying. A good blog with interesting content, this is what I need. Thanks for making this website, and I will be visiting again. Do you do newsletters by email? Hello there. I discovered your web site by means of Google at the same time as looking for a comparable topic, your website came up. It seems to be good. I’ve bookmarked it in my google bookmarks to come back then. Hiya, I am really glad I have found this info. Nowadays bloggers publish just about gossip and net stuff and this is actually frustrating. A good site with exciting content, that is what I need. Thanks for making this web-site, and I will be visiting again. Do you do newsletters by email? Hiya, I’m really glad I have found this info. Today bloggers publish only about gossip and internet stuff and this is actually frustrating. A good site with exciting content, that’s what I need. Thank you for making this site, and I will be visiting again. Do you do newsletters by email? Hello there. I found your website by the use of Google whilst searching for a similar topic, your website came up. It looks great. I have bookmarked it in my google bookmarks to visit then. Hello there, just became alert to your blog through Google, and found that it is really informative. I’m gonna watch out for brussels. I’ll appreciate if you continue this in future. Numerous people will be benefited from your writing. Cheers! Hiya, I am really glad I have found this info. Today bloggers publish only about gossip and internet stuff and this is really annoying. A good website with exciting content, that is what I need. Thanks for making this site, and I’ll be visiting again. Do you do newsletters by email? Hiya, I’m really glad I have found this information. Today bloggers publish just about gossip and net stuff and this is really irritating. A good blog with exciting content, that is what I need. Thank you for making this site, and I will be visiting again. Do you do newsletters by email? I have been surfing on-line greater than 3 hours these days, yet I by no means discovered any fascinating article like yours. It is pretty price enough for me. In my opinion, if all site owners and bloggers made just right content material as you probably did, the net can be a lot more helpful than ever before. Hiya, I’m really glad I have found this info. Today bloggers publish only about gossip and net stuff and this is really annoying. A good blog with interesting content, this is what I need. Thank you for making this web-site, and I’ll be visiting again. Do you do newsletters by email? Hiya, I’m really glad I have found this information. Nowadays bloggers publish just about gossip and net stuff and this is really annoying. A good blog with exciting content, that is what I need. Thank you for making this web-site, and I’ll be visiting again. Do you do newsletters by email? Hiya, I am really glad I’ve found this information. Nowadays bloggers publish just about gossip and web stuff and this is actually irritating. A good blog with interesting content, that is what I need. Thank you for making this site, and I will be visiting again. Do you do newsletters by email? Hey there. I discovered your web site by the use of Google while searching for a similar matter, your site came up. It appears to be good. I have bookmarked it in my google bookmarks to come back then. Hey there. I discovered your site via Google whilst looking for a related matter, your website got here up. It appears to be great. I’ve bookmarked it in my google bookmarks to visit then. Hiya, I am really glad I’ve found this info. Today bloggers publish just about gossip and net stuff and this is actually annoying. A good blog with interesting content, this is what I need. Thank you for making this web site, and I’ll be visiting again. Do you do newsletters by email? Hiya, I am really glad I’ve found this information. Nowadays bloggers publish only about gossip and net stuff and this is actually annoying. A good blog with interesting content, this is what I need. Thanks for making this website, and I will be visiting again. Do you do newsletters by email? Hello there. I discovered your site by the use of Google even as searching for a related subject, your site got here up. It appears to be good. I’ve bookmarked it in my google bookmarks to visit then. Hiya, I am really glad I have found this information. Nowadays bloggers publish only about gossip and internet stuff and this is actually irritating. A good blog with exciting content, that’s what I need. Thanks for making this website, and I’ll be visiting again. Do you do newsletters by email? Hiya, I’m really glad I have found this information. Today bloggers publish only about gossip and net stuff and this is actually annoying. A good site with interesting content, that’s what I need. Thanks for making this site, and I’ll be visiting again. Do you do newsletters by email? Hey there. I discovered your blog by means of Google whilst looking for a similar matter, your site came up. It appears great. I’ve bookmarked it in my google bookmarks to come back then. I absolutely love your blog.. Very nice colors & theme. Did you make this web site yourself? Please reply back as I’m wanting to create my very own blog and want to learn where you got this from or what the theme is named. Cheers! Hello there. I discovered your web site by means of Google even as searching for a similar topic, your website got here up. It appears good. I have bookmarked it in my google bookmarks to come back then. Hiya, I’m really glad I’ve found this info. Today bloggers publish only about gossip and internet stuff and this is actually frustrating. A good site with exciting content, this is what I need. Thank you for making this website, and I’ll be visiting again. Do you do newsletters by email? Hiya, I am really glad I’ve found this info. Nowadays bloggers publish just about gossip and internet stuff and this is actually annoying. A good web site with interesting content, that’s what I need. Thank you for making this website, and I will be visiting again. Do you do newsletters by email? Hiya, I am really glad I have found this information. Nowadays bloggers publish only about gossip and internet stuff and this is actually frustrating. A good web site with exciting content, that is what I need. Thanks for making this web site, and I’ll be visiting again. Do you do newsletters by email? Hiya, I’m really glad I have found this information. Nowadays bloggers publish only about gossip and net stuff and this is actually irritating. A good site with exciting content, that’s what I need. Thanks for making this site, and I’ll be visiting again. Do you do newsletters by email? Hiya, I’m really glad I’ve found this info. Today bloggers publish just about gossip and net stuff and this is actually frustrating. A good web site with exciting content, that is what I need. Thank you for making this web-site, and I’ll be visiting again. Do you do newsletters by email? Hiya, I’m really glad I have found this information. Today bloggers publish only about gossip and internet stuff and this is really frustrating. A good web site with exciting content, this is what I need. Thanks for making this site, and I’ll be visiting again. Do you do newsletters by email? Hiya, I am really glad I’ve found this information. Today bloggers publish just about gossip and net stuff and this is actually irritating. A good web site with exciting content, that’s what I need. Thanks for making this web-site, and I’ll be visiting again. Do you do newsletters by email? Hiya, I am really glad I have found this information. Nowadays bloggers publish just about gossip and internet stuff and this is actually frustrating. A good web site with exciting content, that’s what I need. Thank you for making this website, and I will be visiting again. Do you do newsletters by email? Thank you a lot for sharing this with all of us you really understand what you’re talking about! Bookmarked. Please additionally seek advice from my site =). We may have a hyperlink trade contract between us! Hiya, I am really glad I’ve found this information. Nowadays bloggers publish only about gossip and web stuff and this is actually irritating. A good blog with exciting content, this is what I need. Thank you for making this site, and I’ll be visiting again. Do you do newsletters by email? Hello there. I discovered your blog via Google whilst looking for a comparable subject, your website came up. It appears good. I have bookmarked it in my google bookmarks to visit then. Hi there. I discovered your blog via Google whilst looking for a related subject, your site got here up. It appears to be great. I have bookmarked it in my google bookmarks to come back then. Hiya, I am really glad I’ve found this information. Nowadays bloggers publish only about gossip and internet stuff and this is really frustrating. A good site with exciting content, that is what I need. Thank you for making this web site, and I will be visiting again. Do you do newsletters by email? Hiya, I am really glad I have found this info. Nowadays bloggers publish just about gossip and internet stuff and this is really frustrating. A good web site with interesting content, that is what I need. Thank you for making this web site, and I’ll be visiting again. Do you do newsletters by email? Hiya, I’m really glad I have found this info. Today bloggers publish just about gossip and internet stuff and this is actually annoying. A good web site with interesting content, this is what I need. Thanks for making this site, and I’ll be visiting again. Do you do newsletters by email? Hi there. I discovered your website by the use of Google whilst searching for a related topic, your website got here up. It appears to be good. I have bookmarked it in my google bookmarks to come back then. Hiya, I am really glad I’ve found this information. Today bloggers publish only about gossip and net stuff and this is actually irritating. A good blog with exciting content, that’s what I need. Thanks for making this web-site, and I will be visiting again. Do you do newsletters by email? Hi there. I found your site by means of Google even as looking for a similar matter, your website got here up. It seems great. I’ve bookmarked it in my google bookmarks to visit then. Hiya, I’m really glad I’ve found this information. Nowadays bloggers publish only about gossip and net stuff and this is actually irritating. A good blog with interesting content, this is what I need. Thank you for making this web-site, and I will be visiting again. Do you do newsletters by email? Hey there. I found your blog via Google while looking for a similar subject, your web site got here up. It seems great. I have bookmarked it in my google bookmarks to visit then. Hi there. I discovered your blog by the use of Google at the same time as looking for a comparable matter, your web site got here up. It appears to be great. I’ve bookmarked it in my google bookmarks to visit then. Hello there. I discovered your blog by means of Google at the same time as looking for a comparable topic, your site came up. It seems great. I’ve bookmarked it in my google bookmarks to come back then. Hi there. I found your web site by means of Google even as looking for a similar subject, your website got here up. It appears to be good. I have bookmarked it in my google bookmarks to come back then. Hey there. I found your blog by the use of Google whilst looking for a related matter, your website came up. It looks great. I have bookmarked it in my google bookmarks to visit then. Hiya, I am really glad I’ve found this information. Nowadays bloggers publish only about gossip and internet stuff and this is really annoying. A good web site with interesting content, that’s what I need. Thanks for making this web site, and I will be visiting again. Do you do newsletters by email? Hiya, I am really glad I have found this information. Today bloggers publish just about gossip and web stuff and this is actually annoying. A good web site with interesting content, this is what I need. Thanks for making this web site, and I’ll be visiting again. Do you do newsletters by email? Hello there. I discovered your site by way of Google at the same time as searching for a similar subject, your web site came up. It seems great. I have bookmarked it in my google bookmarks to visit then. Hiya, I am really glad I’ve found this info. Today bloggers publish only about gossip and internet stuff and this is really frustrating. A good web site with exciting content, that is what I need. Thanks for making this site, and I will be visiting again. Do you do newsletters by email? Hiya, I’m really glad I have found this information. Nowadays bloggers publish only about gossip and net stuff and this is really annoying. A good web site with exciting content, this is what I need. Thank you for making this web-site, and I’ll be visiting again. Do you do newsletters by email? Hiya, I’m really glad I’ve found this information. Today bloggers publish just about gossip and internet stuff and this is really irritating. A good blog with exciting content, that is what I need. Thanks for making this site, and I will be visiting again. Do you do newsletters by email? Giving thanks for your write-up. I know that with today’s complicated world, folks have many beliefs and this has made it to be really hard for learners just like me. However, you have made the idea very easy for me to fully grasp and I now have the awareness of the correct thing. Your own continued reputation as among the top experts about this topic may be boosted through words associated with appreciation from subscribers like me. Thanks, once more. Hiya, I’m really glad I’ve found this information. Nowadays bloggers publish only about gossip and web stuff and this is actually frustrating. A good website with exciting content, that’s what I need. Thank you for making this web site, and I’ll be visiting again. Do you do newsletters by email? Hiya, I’m really glad I’ve found this information. Nowadays bloggers publish just about gossip and net stuff and this is really annoying. A good website with interesting content, this is what I need. Thank you for making this site, and I’ll be visiting again. Do you do newsletters by email? Hiya, I am really glad I’ve found this information. Today bloggers publish only about gossip and internet stuff and this is really irritating. A good website with interesting content, that is what I need. Thank you for making this web-site, and I’ll be visiting again. Do you do newsletters by email? Hi there. I found your web site by the use of Google even as looking for a comparable subject, your website got here up. It seems to be good. I have bookmarked it in my google bookmarks to come back then. Hi there. I discovered your blog via Google even as searching for a related matter, your website got here up. It appears good. I have bookmarked it in my google bookmarks to visit then. Hiya, I’m really glad I have found this info. Today bloggers publish just about gossip and net stuff and this is actually annoying. A good web site with interesting content, that is what I need. Thank you for making this website, and I’ll be visiting again. Do you do newsletters by email? Hiya, I am really glad I’ve found this information. Today bloggers publish only about gossip and web stuff and this is actually irritating. A good website with interesting content, this is what I need. Thank you for making this web-site, and I will be visiting again. Do you do newsletters by email? Hiya, I am really glad I’ve found this info. Nowadays bloggers publish only about gossip and web stuff and this is actually annoying. A good site with interesting content, that’s what I need. Thanks for making this website, and I’ll be visiting again. Do you do newsletters by email? Hi there. I found your blog by means of Google whilst looking for a comparable topic, your site came up. It seems to be good. I have bookmarked it in my google bookmarks to come back then. Hi there. I found your site via Google at the same time as looking for a similar matter, your website came up. It seems to be great. I’ve bookmarked it in my google bookmarks to come back then. Hiya, I am really glad I’ve found this information. Today bloggers publish just about gossip and net stuff and this is actually irritating. A good website with exciting content, this is what I need. Thank you for making this web site, and I will be visiting again. Do you do newsletters by email? Hi there. I found your site by means of Google whilst looking for a related subject, your web site got here up. It seems to be good. I have bookmarked it in my google bookmarks to visit then. Hi there. I discovered your blog by means of Google whilst looking for a related subject, your web site came up. It appears good. I’ve bookmarked it in my google bookmarks to visit then. Hi there. I found your web site by way of Google while searching for a comparable matter, your web site came up. It seems great. I have bookmarked it in my google bookmarks to come back then. Hi there. I discovered your web site by means of Google at the same time as looking for a comparable matter, your site got here up. It appears good. I have bookmarked it in my google bookmarks to come back then. Hiya, I’m really glad I’ve found this info. Today bloggers publish only about gossip and web stuff and this is really frustrating. A good site with exciting content, that is what I need. Thanks for making this website, and I’ll be visiting again. Do you do newsletters by email? Hello there. I discovered your blog by way of Google even as searching for a similar subject, your web site got here up. It appears good. I’ve bookmarked it in my google bookmarks to come back then. Hello there. I found your blog by way of Google whilst looking for a comparable matter, your website got here up. It seems good. I have bookmarked it in my google bookmarks to visit then. Hiya, I am really glad I’ve found this information. Today bloggers publish only about gossip and internet stuff and this is really annoying. A good web site with interesting content, that’s what I need. Thanks for making this site, and I’ll be visiting again. Do you do newsletters by email? Hi there. I found your website by way of Google even as searching for a comparable matter, your web site came up. It appears to be great. I have bookmarked it in my google bookmarks to come back then. Hi there. I discovered your website by way of Google whilst looking for a comparable topic, your site got here up. It appears great. I have bookmarked it in my google bookmarks to visit then. Hiya, I am really glad I’ve found this info. Nowadays bloggers publish only about gossip and net stuff and this is really annoying. A good site with interesting content, that is what I need. Thanks for making this web site, and I will be visiting again. Do you do newsletters by email? Hey there. I discovered your site by way of Google while looking for a comparable subject, your site got here up. It looks good. I’ve bookmarked it in my google bookmarks to come back then. Hello there. I found your web site by means of Google at the same time as looking for a related matter, your web site came up. It appears good. I’ve bookmarked it in my google bookmarks to visit then. What type of customer email are you most frustrated with? Make a Myth vs. Fact post. I wanted to send you this very small remark to be able to say thanks a lot yet again just for the amazing views you have discussed on this site. It has been wonderfully generous with people like you to give freely all that a lot of folks might have marketed as an e-book in making some cash on their own, primarily given that you might well have tried it in the event you desired. Those secrets additionally served to be a fantastic way to comprehend most people have similar keenness similar to my very own to see a lot more related to this issue. I am certain there are lots of more pleasant situations in the future for individuals who examine your website. You could certainly see your skills in the work you write. The world hopes for even more passionate writers like you who are not afraid to say how they believe. At all times follow your heart. You really make it appear so easy with your presentation but I in finding this matter to be really one thing that I believe I’d never understand. It kind of feels too complicated and extremely broad for me. I am looking forward for your subsequent submit, I¡¦ll try to get the grasp of it! Hey there. I found your web site by the use of Google whilst searching for a similar matter, your website got here up. It seems great. I’ve bookmarked it in my google bookmarks to visit then. Hey there. I discovered your site via Google even as searching for a related subject, your web site got here up. It looks great. I’ve bookmarked it in my google bookmarks to visit then. I am also commenting to make you be aware of what a notable encounter my wife’s child experienced visiting the blog. She came to understand many issues, not to mention what it is like to possess a great giving style to make other people without hassle know precisely selected complex issues. You undoubtedly did more than her desires. I appreciate you for supplying such helpful, safe, educational and easy tips about this topic to Mary. Hiya, I am really glad I have found this info. Today bloggers publish just about gossip and web stuff and this is really frustrating. A good web site with interesting content, this is what I need. Thanks for making this site, and I’ll be visiting again. Do you do newsletters by email? Hiya, I am really glad I have found this info. Today bloggers publish only about gossips and net and this is really frustrating. A good site with exciting content, this is what I need. Thank you for keeping this website, I’ll be visiting it. Do you do newsletters? Can’t find it. Hey there. I discovered your blog by means of Google even as looking for a similar matter, your web site came up. It looks good. I’ve bookmarked it in my google bookmarks to visit then. Hiya, I’m really glad I have found this information. Nowadays bloggers publish only about gossip and internet stuff and this is really frustrating. A good website with exciting content, this is what I need. Thank you for making this web-site, and I will be visiting again. Do you do newsletters by email? Hello there. I discovered your blog by way of Google whilst looking for a related subject, your site got here up. It looks great. I have bookmarked it in my google bookmarks to come back then. Hey there. I found your web site via Google whilst searching for a comparable matter, your site came up. It seems to be great. I’ve bookmarked it in my google bookmarks to come back then. Hey there. I discovered your blog by the use of Google at the same time as looking for a related subject, your web site got here up. It seems good. I have bookmarked it in my google bookmarks to come back then. Hey there. I found your web site by way of Google whilst searching for a similar topic, your web site came up. It appears good. I have bookmarked it in my google bookmarks to visit then. Hi there. I found your web site by means of Google while searching for a comparable topic, your site got here up. It looks great. I’ve bookmarked it in my google bookmarks to come back then. Hiya, I am really glad I have found this info. Today bloggers publish just about gossip and internet stuff and this is actually irritating. A good website with interesting content, that is what I need. Thanks for making this website, and I’ll be visiting again. Do you do newsletters by email? Hiya, I am really glad I have found this information. Today bloggers publish only about gossip and web stuff and this is actually frustrating. A good web site with interesting content, this is what I need. Thanks for making this web-site, and I’ll be visiting again. Do you do newsletters by email? Hiya, I’m really glad I have found this information. Nowadays bloggers publish just about gossip and web stuff and this is actually annoying. A good site with interesting content, that’s what I need. Thank you for making this site, and I’ll be visiting again. Do you do newsletters by email? Hiya, I am really glad I’ve found this information. Nowadays bloggers publish just about gossip and web stuff and this is really frustrating. A good blog with exciting content, that is what I need. Thank you for making this web site, and I will be visiting again. Do you do newsletters by email? Hiya, I’m really glad I’ve found this information. Today bloggers publish just about gossip and internet stuff and this is really irritating. A good blog with interesting content, this is what I need. Thank you for making this website, and I will be visiting again. Do you do newsletters by email? Hiya, I am really glad I’ve found this information. Today bloggers publish just about gossip and net stuff and this is really frustrating. A good website with interesting content, this is what I need. Thank you for making this web-site, and I’ll be visiting again. Do you do newsletters by email? Hiya, I’m really glad I’ve found this information. Nowadays bloggers publish just about gossip and web stuff and this is really frustrating. A good blog with exciting content, this is what I need. Thank you for making this website, and I will be visiting again. Do you do newsletters by email? Hello there. I found your blog via Google even as searching for a comparable subject, your site came up. It seems great. I’ve bookmarked it in my google bookmarks to visit then. Hiya, I’m really glad I have found this information. Nowadays bloggers publish just about gossip and net stuff and this is actually frustrating. A good blog with exciting content, this is what I need. Thanks for making this site, and I will be visiting again. Do you do newsletters by email? Hello there. I found your web site via Google at the same time as looking for a related subject, your site came up. It looks great. I have bookmarked it in my google bookmarks to visit then. Hi there. I found your site by the use of Google even as looking for a comparable topic, your web site came up. It looks good. I’ve bookmarked it in my google bookmarks to visit then. Hiya, I am really glad I have found this info. Today bloggers publish only about gossip and web stuff and this is actually annoying. A good blog with interesting content, this is what I need. Thanks for making this web site, and I will be visiting again. Do you do newsletters by email? Hey there. I discovered your web site by means of Google whilst searching for a related topic, your site came up. It looks good. I have bookmarked it in my google bookmarks to come back then. Hiya, I’m really glad I’ve found this info. Today bloggers publish just about gossip and internet stuff and this is actually frustrating. A good web site with interesting content, that is what I need. Thanks for making this web-site, and I’ll be visiting again. Do you do newsletters by email? Hiya, I’m really glad I have found this information. Nowadays bloggers publish only about gossip and net stuff and this is really frustrating. A good web site with interesting content, this is what I need. Thanks for making this website, and I’ll be visiting again. Do you do newsletters by email? Hi there. I discovered your website by means of Google even as looking for a similar matter, your site got here up. It looks good. I’ve bookmarked it in my google bookmarks to visit then. Hiya, I am really glad I have found this info. Nowadays bloggers publish just about gossip and net stuff and this is actually irritating. A good website with exciting content, this is what I need. Thanks for making this web-site, and I’ll be visiting again. Do you do newsletters by email? Hiya, I’m really glad I have found this information. Nowadays bloggers publish just about gossip and internet stuff and this is really annoying. A good website with interesting content, that’s what I need. Thanks for making this site, and I’ll be visiting again. Do you do newsletters by email? Hiya, I am really glad I’ve found this info. Nowadays bloggers publish only about gossip and web stuff and this is actually annoying. A good website with interesting content, that’s what I need. Thanks for making this site, and I will be visiting again. Do you do newsletters by email? Hello there. I discovered your site via Google even as looking for a similar matter, your site came up. It seems great. I have bookmarked it in my google bookmarks to visit then. Hello there. I found your blog via Google whilst looking for a similar topic, your website got here up. It appears great. I have bookmarked it in my google bookmarks to come back then. Hello there. I found your website by way of Google while looking for a related subject, your web site got here up. It seems to be good. I’ve bookmarked it in my google bookmarks to visit then. Hiya, I am really glad I’ve found this info. Nowadays bloggers publish only about gossip and net stuff and this is really irritating. A good blog with exciting content, that is what I need. Thanks for making this web-site, and I’ll be visiting again. Do you do newsletters by email? Hiya, I am really glad I’ve found this info. Today bloggers publish just about gossip and web stuff and this is really frustrating. A good blog with exciting content, that is what I need. Thank you for making this web site, and I’ll be visiting again. Do you do newsletters by email? Hiya, I’m really glad I have found this info. Today bloggers publish only about gossip and web stuff and this is actually irritating. A good website with interesting content, that is what I need. Thanks for making this website, and I’ll be visiting again. Do you do newsletters by email? Hiya, I’m really glad I have found this information. Today bloggers publish only about gossip and internet stuff and this is really frustrating. A good site with interesting content, this is what I need. Thanks for making this web site, and I will be visiting again. Do you do newsletters by email? Hi there. I discovered your website via Google even as looking for a related subject, your site came up. It seems to be great. I have bookmarked it in my google bookmarks to visit then. I’m still learning from you, as I’m trying to achieve my goals. I absolutely love reading everything that is written on your site.Keep the posts coming. I loved it! I simply wanted to say thanks yet again. I am not sure what I could possibly have worked on without the actual tricks contributed by you about such a subject. It actually was the depressing scenario for me, however , being able to see a skilled avenue you handled the issue made me to jump for happiness. I will be grateful for your assistance as well as believe you comprehend what a great job your are putting in educating most people through your web page. I am sure you’ve never got to know any of us. Hiya, I’m really glad I’ve found this information. Nowadays bloggers publish only about gossip and web stuff and this is really irritating. A good site with interesting content, that’s what I need. Thanks for making this website, and I will be visiting again. Do you do newsletters by email? Hiya, I’m really glad I’ve found this information. Today bloggers publish only about gossip and net stuff and this is actually irritating. A good web site with exciting content, that’s what I need. Thank you for making this site, and I’ll be visiting again. Do you do newsletters by email? Hi there. I discovered your site by way of Google while looking for a similar subject, your web site got here up. It seems to be good. I’ve bookmarked it in my google bookmarks to come back then. Hiya, I am really glad I’ve found this info. Nowadays bloggers publish only about gossip and web stuff and this is really annoying. A good website with exciting content, that is what I need. Thanks for making this website, and I will be visiting again. Do you do newsletters by email? Hiya, I’m really glad I’ve found this info. Nowadays bloggers publish only about gossip and web stuff and this is really irritating. A good web site with interesting content, that is what I need. Thanks for making this site, and I’ll be visiting again. Do you do newsletters by email? Hi there. I discovered your blog by the use of Google even as searching for a comparable topic, your website came up. It appears great. I’ve bookmarked it in my google bookmarks to visit then. Hello there. I found your web site via Google at the same time as looking for a comparable matter, your site came up. It seems good. I’ve bookmarked it in my google bookmarks to visit then. I’m really impressed with your writing skills as well as with the layout on your weblog. Is this a paid theme or did you modify it yourself? Either way keep up the nice quality writing, it’s rare to see a nice blog like this one these days..
I¡¦m no longer sure where you are getting your info, but great topic. I must spend a while learning more or figuring out more. Thanks for great info I used to be looking for this information for my mission. Hi there. I discovered your site by means of Google at the same time as looking for a related matter, your site got here up. It seems to be great. I’ve bookmarked it in my google bookmarks to come back then. Hey there. I discovered your website via Google at the same time as looking for a similar topic, your web site got here up. It seems to be good. I have bookmarked it in my google bookmarks to visit then. Hello there. I discovered your blog by means of Google even as looking for a similar subject, your web site came up. It seems to be great. I’ve bookmarked it in my google bookmarks to come back then. Hey there. I discovered your blog via Google while looking for a comparable topic, your website came up. It seems great. I have bookmarked it in my google bookmarks to come back then. Hello there. I discovered your site via Google while looking for a similar subject, your website got here up. It seems good. I’ve bookmarked it in my google bookmarks to visit then. Hello there. I found your site by way of Google even as searching for a comparable subject, your web site got here up. It looks great. I have bookmarked it in my google bookmarks to come back then. Hiya, I’m really glad I’ve found this info. Today bloggers publish only about gossip and internet stuff and this is actually frustrating. A good web site with exciting content, this is what I need. Thanks for making this website, and I’ll be visiting again. Do you do newsletters by email? Hi there. I found your blog by way of Google whilst searching for a comparable subject, your site came up. It appears to be good. I’ve bookmarked it in my google bookmarks to come back then. Hello there. I discovered your website by the use of Google even as searching for a related topic, your website got here up. It appears great. I have bookmarked it in my google bookmarks to visit then. Hiya, I am really glad I have found this information. Today bloggers publish just about gossip and internet stuff and this is really annoying. A good website with exciting content, this is what I need. Thank you for making this web site, and I will be visiting again. Do you do newsletters by email? Hiya, I am really glad I’ve found this information. Nowadays bloggers publish only about gossip and net stuff and this is really annoying. A good blog with exciting content, that’s what I need. Thank you for making this web-site, and I’ll be visiting again. Do you do newsletters by email? Hey there. I found your site by the use of Google even as looking for a related topic, your web site came up. It seems good. I’ve bookmarked it in my google bookmarks to visit then. Hello there. I discovered your website by means of Google whilst searching for a comparable matter, your web site came up. It looks great. I have bookmarked it in my google bookmarks to visit then. Hello there. I discovered your blog by way of Google while searching for a similar subject, your website got here up. It appears great. I’ve bookmarked it in my google bookmarks to visit then. Hello there. I discovered your website by the use of Google at the same time as searching for a comparable topic, your site came up. It looks great. I have bookmarked it in my google bookmarks to visit then. Hiya, I’m really glad I’ve found this info. Nowadays bloggers publish just about gossip and web stuff and this is really annoying. A good site with exciting content, this is what I need. Thanks for making this web site, and I’ll be visiting again. Do you do newsletters by email? Hiya, I am really glad I have found this info. Nowadays bloggers publish just about gossip and web stuff and this is actually annoying. A good website with interesting content, this is what I need. Thank you for making this website, and I’ll be visiting again. Do you do newsletters by email? Hello there. I found your blog via Google while searching for a similar subject, your website got here up. It looks good. I’ve bookmarked it in my google bookmarks to come back then. Hiya, I am really glad I’ve found this info. Nowadays bloggers publish just about gossip and web stuff and this is actually irritating. A good web site with exciting content, this is what I need. Thanks for making this web-site, and I will be visiting again. Do you do newsletters by email? Hi there. I discovered your site by the use of Google whilst searching for a comparable topic, your web site got here up. It appears good. I’ve bookmarked it in my google bookmarks to come back then. you’re in reality a excellent webmaster. The web site loading velocity is incredible. It seems that you’re doing any distinctive trick. Also, The contents are masterwork. you have done a great task in this topic! I loved as much as you’ll receive carried out right here. The sketch is attractive, your authored material stylish. nonetheless, you command get got an nervousness over that you wish be delivering the following. unwell unquestionably come further formerly again since exactly the same nearly very often inside case you shield this hike. Hello there. I discovered your website by way of Google at the same time as searching for a comparable topic, your web site came up. It looks great. I’ve bookmarked it in my google bookmarks to visit then. Hiya, I’m really glad I have found this info. Nowadays bloggers publish only about gossip and internet stuff and this is really frustrating. A good blog with interesting content, that is what I need. Thank you for making this website, and I’ll be visiting again. Do you do newsletters by email? Hi there. I found your web site by the use of Google while searching for a comparable subject, your web site came up. It appears good. I have bookmarked it in my google bookmarks to come back then. whoah this blog is great i really like reading your posts. Keep up the great paintings! You know, many people are hunting round for this info, you could aid them greatly. Hi there. I discovered your site by means of Google whilst searching for a comparable matter, your site came up. It seems great. I have bookmarked it in my google bookmarks to visit then. Hiya, I am really glad I have found this information. Today bloggers publish just about gossip and web stuff and this is actually irritating. A good site with interesting content, that’s what I need. Thanks for making this website, and I will be visiting again. Do you do newsletters by email? Hiya, I’m really glad I’ve found this information. Today bloggers publish just about gossip and web stuff and this is actually annoying. A good blog with exciting content, that is what I need. Thank you for making this web site, and I’ll be visiting again. Do you do newsletters by email? consider this, suppose you composed a catchier post title? however what if you added something that grabbed people’s attention? I mean PANDORA Kick-off – HRYO – Human Rights Youth Organization is a little vanilla. pic or two to get people excited about everything’ve got to say. Hey there. I found your website by means of Google whilst searching for a related matter, your site got here up. It appears great. I have bookmarked it in my google bookmarks to visit then. Hi there. I discovered your website by way of Google even as searching for a similar topic, your web site got here up. It looks good. I’ve bookmarked it in my google bookmarks to visit then. Hiya, I’m really glad I’ve found this info. Today bloggers publish just about gossip and internet stuff and this is actually irritating. A good web site with exciting content, this is what I need. Thank you for making this web-site, and I will be visiting again. Do you do newsletters by email? Hello there. I discovered your blog by the use of Google whilst searching for a comparable topic, your website came up. It seems good. I have bookmarked it in my google bookmarks to visit then. Hi there. I found your web site by the use of Google while searching for a comparable subject, your website came up. It seems good. I have bookmarked it in my google bookmarks to visit then. Hi there. I discovered your blog by way of Google while searching for a related topic, your website came up. It seems good. I’ve bookmarked it in my google bookmarks to come back then. Hiya, I’m really glad I’ve found this information. Today bloggers publish just about gossip and internet stuff and this is really irritating. A good site with interesting content, this is what I need. Thank you for making this web-site, and I’ll be visiting again. Do you do newsletters by email? Hey there. I found your site by the use of Google while looking for a comparable subject, your site came up. It appears to be great. I’ve bookmarked it in my google bookmarks to visit then. Hello there. I found your web site via Google at the same time as looking for a similar subject, your web site got here up. It appears good. I’ve bookmarked it in my google bookmarks to visit then. Hello there. I found your blog by means of Google while looking for a comparable matter, your web site came up. It looks good. I’ve bookmarked it in my google bookmarks to come back then. Hi there. I found your site via Google at the same time as looking for a related matter, your website got here up. It looks great. I have bookmarked it in my google bookmarks to come back then. Hi there. I discovered your website via Google even as looking for a similar topic, your website got here up. It appears great. I’ve bookmarked it in my google bookmarks to visit then. Hiya, I am really glad I’ve found this information. Today bloggers publish just about gossip and internet stuff and this is really frustrating. A good blog with exciting content, this is what I need. Thanks for making this website, and I’ll be visiting again. Do you do newsletters by email? blog’s post to be updated daily. It includes good data. Hey there. I discovered your site by means of Google at the same time as searching for a similar matter, your web site got here up. It appears to be good. I have bookmarked it in my google bookmarks to visit then. Hiya, I am really glad I have found this information. Today bloggers publish just about gossip and web stuff and this is actually annoying. A good site with exciting content, this is what I need. Thanks for making this site, and I’ll be visiting again. Do you do newsletters by email? Hey there. I discovered your website by way of Google at the same time as searching for a comparable matter, your web site came up. It appears great. I have bookmarked it in my google bookmarks to come back then. Hiya, I’m really glad I’ve found this information. Nowadays bloggers publish only about gossip and internet stuff and this is really annoying. A good web site with interesting content, that is what I need. Thanks for making this website, and I will be visiting again. Do you do newsletters by email? Hello there. I discovered your website by way of Google while searching for a comparable subject, your site got here up. It looks great. I’ve bookmarked it in my google bookmarks to visit then. I’m still learning from you, while I’m making my way to the top as well. I certainly liked reading everything that is written on your site.Keep the aarticles coming. I liked it! Perfect! Interesting informations over this website. It’s pretty worth enough for me. Personally, if all webmasters and bloggers made good content as you did, the web will be a lot more useful than ever before. I couldn’t resist commenting. I’ve spent some hours searching for such tips. I’ll also share it with a couple of friends interested in it. I’ve just bookmarked this web. Done with the search done, I will find some live hot gay cams. Thanks!! Greetings from Florida! Hiya, I am really glad I have found this info. Nowadays bloggers publish only about gossip and internet stuff and this is really irritating. A good site with interesting content, this is what I need. Thank you for making this website, and I’ll be visiting again. Do you do newsletters by email? Hey there. I discovered your blog by means of Google whilst searching for a related topic, your site got here up. It appears great. I’ve bookmarked it in my google bookmarks to visit then. Hi there. I discovered your web site by the use of Google whilst looking for a related topic, your web site came up. It seems good. I’ve bookmarked it in my google bookmarks to come back then. Hello there. I discovered your blog by the use of Google whilst searching for a comparable topic, your website got here up. It seems good. I’ve bookmarked it in my google bookmarks to come back then. Hiya, I am really glad I have found this information. Today bloggers publish only about gossip and web stuff and this is really irritating. A good site with exciting content, that’s what I need. Thanks for making this web-site, and I’ll be visiting again. Do you do newsletters by email? Hiya, I am really glad I’ve found this information. Today bloggers publish only about gossip and web stuff and this is actually irritating. A good web site with exciting content, that’s what I need. Thank you for making this web-site, and I will be visiting again. Do you do newsletters by email? Hi there. I discovered your web site by the use of Google even as looking for a similar subject, your web site came up. It appears to be great. I have bookmarked it in my google bookmarks to visit then. Hello there. I found your site via Google whilst looking for a similar topic, your website came up. It seems to be great. I have bookmarked it in my google bookmarks to come back then. Hey there. I found your web site by means of Google whilst searching for a comparable subject, your web site got here up. It seems great. I have bookmarked it in my google bookmarks to come back then. Hiya, I am really glad I’ve found this info. Today bloggers publish just about gossip and internet stuff and this is really frustrating. A good site with interesting content, this is what I need. Thank you for making this web site, and I’ll be visiting again. Do you do newsletters by email? Hi there. I discovered your blog by means of Google whilst looking for a similar topic, your website came up. It seems to be good. I’ve bookmarked it in my google bookmarks to visit then. Hiya, I am really glad I’ve found this info. Today bloggers publish just about gossip and web stuff and this is really frustrating. A good website with exciting content, that is what I need. Thanks for making this web site, and I will be visiting again. Do you do newsletters by email? I and also my pals ended up looking through the best tips and tricks on the blog and so all of the sudden got a terrible suspicion I never expressed respect to the website owner for those tips. Those guys ended up passionate to read through all of them and have now very much been taking advantage of them. Many thanks for being so helpful and then for making a decision on certain fabulous issues millions of individuals are really desirous to be aware of. Our sincere apologies for not saying thanks to sooner. Hiya, I’m really glad I’ve found this information. Today bloggers publish just about gossip and net stuff and this is actually frustrating. A good website with interesting content, this is what I need. Thanks for making this website, and I will be visiting again. Do you do newsletters by email? Hiya, I’m really glad I’ve found this info. Nowadays bloggers publish just about gossip and internet stuff and this is actually frustrating. A good site with interesting content, that is what I need. Thank you for making this web site, and I will be visiting again. Do you do newsletters by email? Hi there. I found your site by way of Google at the same time as searching for a similar subject, your website came up. It appears great. I’ve bookmarked it in my google bookmarks to visit then. Hiya, I am really glad I’ve found this info. Today bloggers publish only about gossip and internet stuff and this is really annoying. A good blog with interesting content, that is what I need. Thanks for making this web-site, and I will be visiting again. Do you do newsletters by email? Hey there. I found your web site by means of Google at the same time as searching for a related topic, your site came up. It looks good. I’ve bookmarked it in my google bookmarks to come back then. Hi there. I found your website by way of Google while searching for a comparable subject, your website came up. It looks good. I have bookmarked it in my google bookmarks to visit then. Hiya, I’m really glad I have found this information. Nowadays bloggers publish only about gossip and web stuff and this is really annoying. A good blog with interesting content, that is what I need. Thanks for making this web site, and I’ll be visiting again. Do you do newsletters by email? Hey there. I found your site by the use of Google whilst searching for a comparable topic, your site got here up. It appears to be great. I’ve bookmarked it in my google bookmarks to visit then. Hiya, I’m really glad I’ve found this information. Today bloggers publish only about gossip and web stuff and this is really irritating. A good site with exciting content, that is what I need. Thanks for making this website, and I will be visiting again. Do you do newsletters by email? Hiya, I am really glad I have found this info. Nowadays bloggers publish just about gossip and internet stuff and this is actually annoying. A good site with exciting content, this is what I need. Thank you for making this site, and I’ll be visiting again. Do you do newsletters by email? Hiya, I am really glad I have found this information. Today bloggers publish only about gossip and internet stuff and this is really annoying. A good web site with exciting content, this is what I need. Thank you for making this web site, and I’ll be visiting again. Do you do newsletters by email? Hey there. I found your web site by means of Google even as looking for a comparable topic, your site came up. It seems great. I have bookmarked it in my google bookmarks to visit then. Hi there. I found your site by means of Google at the same time as looking for a similar topic, your site came up. It appears to be great. I have bookmarked it in my google bookmarks to come back then. Hiya, I am really glad I have found this information. Nowadays bloggers publish just about gossip and web stuff and this is actually irritating. A good blog with interesting content, that is what I need. Thanks for making this site, and I will be visiting again. Do you do newsletters by email? Hi there. I discovered your site by means of Google at the same time as searching for a related subject, your web site came up. It looks good. I have bookmarked it in my google bookmarks to visit then. Hi there. I discovered your blog by the use of Google at the same time as searching for a similar subject, your web site got here up. It appears good. I have bookmarked it in my google bookmarks to come back then. Hiya, I am really glad I have found this information. Nowadays bloggers publish just about gossip and internet stuff and this is actually frustrating. A good web site with interesting content, that’s what I need. Thank you for making this web-site, and I will be visiting again. Do you do newsletters by email? Hiya, I am really glad I’ve found this info. Today bloggers publish just about gossip and internet stuff and this is actually frustrating. A good site with interesting content, this is what I need. Thanks for making this website, and I’ll be visiting again. Do you do newsletters by email? Hey there. I found your web site by the use of Google whilst looking for a comparable matter, your website got here up. It seems to be great. I have bookmarked it in my google bookmarks to come back then. Hi there. I discovered your web site by the use of Google at the same time as looking for a related topic, your web site came up. It seems to be good. I have bookmarked it in my google bookmarks to visit then. Hiya, I’m really glad I have found this information. Nowadays bloggers publish just about gossip and net stuff and this is actually annoying. A good website with exciting content, that’s what I need. Thanks for making this web-site, and I’ll be visiting again. Do you do newsletters by email? Hiya, I’m really glad I have found this info. Today bloggers publish just about gossip and internet stuff and this is really frustrating. A good blog with interesting content, that is what I need. Thank you for making this website, and I will be visiting again. Do you do newsletters by email? Hello there. I discovered your web site via Google while searching for a similar topic, your web site came up. It appears to be great. I have bookmarked it in my google bookmarks to come back then. Hi there. I discovered your site via Google even as looking for a comparable matter, your site got here up. It seems to be great. I’ve bookmarked it in my google bookmarks to come back then. Hiya, I’m really glad I have found this info. Nowadays bloggers publish just about gossip and web stuff and this is actually annoying. A good web site with interesting content, this is what I need. Thank you for making this web-site, and I will be visiting again. Do you do newsletters by email? Hiya, I am really glad I’ve found this information. Today bloggers publish only about gossip and internet stuff and this is actually annoying. A good blog with exciting content, that’s what I need. Thanks for making this web-site, and I’ll be visiting again. Do you do newsletters by email? Hiya, I am really glad I have found this information. Today bloggers publish just about gossip and internet stuff and this is really annoying. A good site with exciting content, that is what I need. Thanks for making this site, and I’ll be visiting again. Do you do newsletters by email? Hey there. I discovered your web site by way of Google even as searching for a related subject, your site got here up. It appears to be good. I have bookmarked it in my google bookmarks to come back then. Hi there. I found your website by means of Google while looking for a similar topic, your site came up. It seems to be great. I’ve bookmarked it in my google bookmarks to come back then. Hello there. I found your website by means of Google at the same time as searching for a related matter, your website came up. It seems to be great. I have bookmarked it in my google bookmarks to visit then. Hey there. I discovered your website by the use of Google even as searching for a similar subject, your website came up. It seems to be great. I’ve bookmarked it in my google bookmarks to come back then. Hey there. I found your website via Google at the same time as searching for a comparable subject, your web site came up. It seems good. I’ve bookmarked it in my google bookmarks to visit then. I would like to thnkx for the efforts you have put in writing this website. I’m hoping the same high-grade web site post from you in the upcoming as well. Actually your creative writing abilities has encouraged me to get my own website now. Really the blogging is spreading its wings rapidly. Your write up is a good example of it. Hiya, I am really glad I have found this info. Today bloggers publish just about gossip and web stuff and this is really irritating. A good site with interesting content, this is what I need. Thanks for making this site, and I’ll be visiting again. Do you do newsletters by email? Hiya, I am really glad I have found this information. Nowadays bloggers publish only about gossip and web stuff and this is actually frustrating. A good site with exciting content, that is what I need. Thanks for making this web site, and I’ll be visiting again. Do you do newsletters by email? Hello there. I discovered your site by the use of Google even as searching for a comparable matter, your website got here up. It looks great. I have bookmarked it in my google bookmarks to visit then. Hiya, I’m really glad I have found this information. Nowadays bloggers publish only about gossip and net stuff and this is really irritating. A good site with interesting content, this is what I need. Thank you for making this website, and I will be visiting again. Do you do newsletters by email? Definitely, what a splendid website and revealing posts, I surely will bookmark your website.All the Best! Wonderful goods from you, man. I’ve understand your stuff previous to and you are just extremely fantastic. I really like what you have acquired here, certainly like what you’re stating and the way in which you say it. You make it enjoyable and you still care for to keep it sensible. I cant wait to read far more from you. This is actually a wonderful website. It is appropriate time to make some plans for the future and it’s time to be happy. I’ve read this post and if I could I want to suggest you some interesting things or tips. Perhaps you can write next articles referring to this article. I wish to read more things about it! Hiya, I’m really glad I have found this information. Nowadays bloggers publish only about gossip and web stuff and this is really irritating. A good site with exciting content, that is what I need. Thank you for making this website, and I will be visiting again. Do you do newsletters by email? Hiya, I’m really glad I’ve found this info. Today bloggers publish just about gossip and internet stuff and this is really irritating. A good web site with interesting content, this is what I need. Thanks for making this web site, and I’ll be visiting again. Do you do newsletters by email? Hey there. I discovered your blog by the use of Google even as searching for a related subject, your web site came up. It looks great. I’ve bookmarked it in my google bookmarks to come back then. Hiya, I’m really glad I’ve found this info. Nowadays bloggers publish only about gossip and net stuff and this is actually irritating. A good web site with exciting content, that is what I need. Thank you for making this website, and I’ll be visiting again. Do you do newsletters by email? Hiya, I am really glad I’ve found this info. Today bloggers publish just about gossip and internet stuff and this is actually irritating. A good site with interesting content, this is what I need. Thanks for making this website, and I’ll be visiting again. Do you do newsletters by email? Hiya, I am really glad I have found this information. Nowadays bloggers publish just about gossip and net stuff and this is actually annoying. A good site with exciting content, this is what I need. Thank you for making this website, and I’ll be visiting again. Do you do newsletters by email? Hello there. I found your web site via Google while searching for a related topic, your web site came up. It seems good. I have bookmarked it in my google bookmarks to visit then. Hiya, I’m really glad I’ve found this information. Nowadays bloggers publish only about gossip and web stuff and this is actually frustrating. A good web site with exciting content, this is what I need. Thanks for making this web site, and I will be visiting again. Do you do newsletters by email? Hiya, I am really glad I have found this info. Today bloggers publish only about gossip and net stuff and this is actually irritating. A good web site with interesting content, that’s what I need. Thank you for making this site, and I will be visiting again. Do you do newsletters by email? Hiya, I am really glad I have found this info. Nowadays bloggers publish only about gossip and net stuff and this is actually frustrating. A good website with exciting content, this is what I need. Thank you for making this site, and I will be visiting again. Do you do newsletters by email? Hiya, I am really glad I have found this information. Nowadays bloggers publish only about gossip and net stuff and this is actually annoying. A good site with exciting content, this is what I need. Thank you for making this web site, and I’ll be visiting again. Do you do newsletters by email? Hiya, I am really glad I’ve found this information. Nowadays bloggers publish just about gossip and web stuff and this is really irritating. A good site with exciting content, that’s what I need. Thank you for making this site, and I’ll be visiting again. Do you do newsletters by email? Hello there. I found your website via Google whilst searching for a comparable matter, your site got here up. It looks great. I have bookmarked it in my google bookmarks to come back then. Hiya, I am really glad I’ve found this info. Today bloggers publish only about gossip and web stuff and this is really annoying. A good website with exciting content, that is what I need. Thank you for making this web-site, and I’ll be visiting again. Do you do newsletters by email? Hiya, I am really glad I have found this information. Nowadays bloggers publish just about gossip and web stuff and this is actually irritating. A good website with interesting content, that’s what I need. Thanks for making this web site, and I’ll be visiting again. Do you do newsletters by email? Hello there. I found your website by the use of Google whilst looking for a comparable topic, your web site got here up. It seems good. I have bookmarked it in my google bookmarks to visit then. Hiya, I’m really glad I have found this info. Nowadays bloggers publish just about gossip and internet stuff and this is really annoying. A good website with exciting content, this is what I need. Thank you for making this site, and I will be visiting again. Do you do newsletters by email? Hiya, I am really glad I have found this information. Nowadays bloggers publish only about gossip and net stuff and this is actually frustrating. A good blog with interesting content, this is what I need. Thank you for making this website, and I will be visiting again. Do you do newsletters by email? Hiya, I am really glad I have found this information. Nowadays bloggers publish only about gossip and web stuff and this is really irritating. A good web site with interesting content, that’s what I need. Thank you for making this website, and I’ll be visiting again. Do you do newsletters by email? Hey there. I discovered your blog by means of Google even as looking for a similar matter, your site got here up. It appears to be great. I have bookmarked it in my google bookmarks to visit then. Hiya, I’m really glad I have found this info. Nowadays bloggers publish only about gossip and internet stuff and this is really frustrating. A good site with exciting content, this is what I need. Thank you for making this site, and I will be visiting again. Do you do newsletters by email? Hello there. I found your site by the use of Google at the same time as looking for a related matter, your web site got here up. It seems to be great. I have bookmarked it in my google bookmarks to visit then. Hiya, I’m really glad I’ve found this information. Today bloggers publish only about gossip and net stuff and this is actually annoying. A good website with exciting content, this is what I need. Thanks for making this web site, and I’ll be visiting again. Do you do newsletters by email? Hiya, I’m really glad I’ve found this info. Today bloggers publish only about gossip and web stuff and this is actually irritating. A good site with interesting content, this is what I need. Thanks for making this website, and I will be visiting again. Do you do newsletters by email? Hiya, I’m really glad I have found this info. Nowadays bloggers publish only about gossip and web stuff and this is really annoying. A good web site with interesting content, this is what I need. Thank you for making this site, and I will be visiting again. Do you do newsletters by email? Hey there. I discovered your site by the use of Google at the same time as looking for a comparable topic, your website got here up. It seems to be great. I have bookmarked it in my google bookmarks to visit then. Hey there. I discovered your blog via Google even as searching for a comparable subject, your website got here up. It looks good. I have bookmarked it in my google bookmarks to come back then. Hiya, I am really glad I’ve found this info. Today bloggers publish only about gossip and internet stuff and this is actually frustrating. A good blog with exciting content, this is what I need. Thanks for making this website, and I will be visiting again. Do you do newsletters by email? Hiya, I’m really glad I’ve found this info. Today bloggers publish just about gossip and internet stuff and this is actually frustrating. A good website with interesting content, that’s what I need. Thank you for making this web-site, and I will be visiting again. Do you do newsletters by email? Hiya, I’m really glad I have found this info. Nowadays bloggers publish only about gossip and web stuff and this is really annoying. A good blog with interesting content, that’s what I need. Thanks for making this web-site, and I will be visiting again. Do you do newsletters by email? Hiya, I am really glad I have found this information. Today bloggers publish just about gossip and net stuff and this is actually irritating. A good site with interesting content, that’s what I need. Thanks for making this web-site, and I will be visiting again. Do you do newsletters by email? Hey there. I found your web site via Google at the same time as looking for a similar matter, your website got here up. It appears to be good. I have bookmarked it in my google bookmarks to come back then. Hello there. I found your web site via Google even as looking for a related subject, your site got here up. It seems good. I have bookmarked it in my google bookmarks to come back then. Hiya, I’m really glad I’ve found this info. Nowadays bloggers publish only about gossip and internet stuff and this is actually annoying. A good web site with exciting content, this is what I need. Thanks for making this web site, and I will be visiting again. Do you do newsletters by email? Hello there. I discovered your blog via Google whilst searching for a similar matter, your site came up. It seems to be great. I have bookmarked it in my google bookmarks to come back then. Hiya, I’m really glad I have found this info. Today bloggers publish just about gossip and internet stuff and this is actually frustrating. A good site with exciting content, that’s what I need. Thank you for making this web-site, and I will be visiting again. Do you do newsletters by email? Hey there. I discovered your website by way of Google even as searching for a similar subject, your website got here up. It appears to be good. I have bookmarked it in my google bookmarks to come back then. Hey there. I found your site by the use of Google whilst looking for a similar topic, your site got here up. It appears to be great. I have bookmarked it in my google bookmarks to visit then. Hi there. I found your site by the use of Google even as searching for a comparable subject, your website came up. It seems to be good. I’ve bookmarked it in my google bookmarks to visit then. Hi there. I discovered your blog via Google while searching for a related subject, your website got here up. It seems good. I have bookmarked it in my google bookmarks to visit then. Hey there. I found your website by means of Google at the same time as searching for a comparable subject, your site came up. It seems to be good. I have bookmarked it in my google bookmarks to visit then. Hello there. I discovered your website via Google whilst looking for a comparable topic, your site got here up. It appears good. I have bookmarked it in my google bookmarks to come back then.